Today's guest post on the Turkish Get-up comes from Cressey Sports Performance coach, Greg Robins. The Turkish Get-up has gained a lot of popularity in recent years, and rightfully so, as it's a fantastic exercise. It is also, however, a complex exercise with many different components that must be "synced up" to get the most benefits of the drill. With that in mind, I wanted to use today's article to discuss the six most common Turkish Get-up technique mistakes I see, and how I correct them with our clients at Cressey Sports Performance. Mistake #1: Not actively getting up. While I didn’t sequence these in any particular order, this mistake is the most common. Too often, people roll into the start of a get-up instead creating tension and actively moving into the first position. This first movement is the definitive step in the get-up, in my opinion. If you cannot reach your forearm actively, you are either using to much load, or approaching the exercise incorrectly. Check out the video below for sign of rolling, or passive movement, and for tips on how to do it correctly. One cue I use all the time when teaching the get-up is to “not let your masses move into your spaces.” In other words, if the body stays in proper alignment, you will have certain amounts of space present between your torso and your limbs / head. When we lose these spaces, you can be sure that you are beginning to rely on passive stability measures, as opposed to creating tension and actively holding positions. Mistake #3: Rocking instead of hinging. The transition from three points of contact to two (or from two to three, on the way back down) is common place for get-up mistakes. Mostly, people tend to rock off, or to the ground. Instead they should utilize a hip hinge pattern to shift the weight completely onto the back knee. This way they can easily lift, or place the hand back onto the ground. Mistake #4: Keeping the joints too soft. In some ways, this mistake could fall into the category of not creating enough space. However, I want to hone in on the importance of extension at a few joints during the movement. Often times I will see people keep these joints in slight flexion, when they should be extended. It is of note that you should also watch for people who tend to hyperextend at the elbows and knees and cue them to stay neutral, so as to promote an active form of stability. You could also apply this to the grip, which should be firm; you don't want to see the hands open. Mistake #5: Not engaging the anterior core. We may have very well beat the “anti-extension” theme to death on this site. That being said, it’s a problem we see time and time again. It also happens to be very common with most folks' Turkish Get-up technique. Make sure you are keeping the ribs down, and core braced throughout this exercise. Mistake #6: Starting with an incorrect bottom arm position. As with any exercise, if you don't set up correctly, your technique will always be suboptimal. With respect to the Turkish Get-up, this is particularly important in the context of where the bottom arm is positioned at the start of the movement. I hope these suggestions help you to improve your Turkish Get-up technique, as this is one exercise you really want to include in your strength training programs because of the many benefits it delivers. And, optimizing technique will ensure that you receive all of those benefits! If you're looking for how we might incorporate Turkish Get-up variations in our strength training programs, be sure to check out The High Performance Handbook, the most versatile strength and conditioning resource available today. It's been super busy over the past ten days, so as we come back to Earth from The High Performance Handbook launch, I want to say a big thank you to everyone who purchased the product and helped to spread the word. I really appreciate your support! I'll be back shortly with some brand new content, but in the meantime, I wanted to highlight some of the articles that were featured during last week's launch. It's a combination of articles I wrote for other sites, as well as ones other individuals authored. Strength Matters, Ya Big Sissy - This was a guest post I wrote for John Romaniello, along with an awesome detailed introduction from him. How to Write and Adapt a Program - This was a great post Dean Somerset wrote to kick off the launch week. His site also featured a guest post from me - Band-Resisted Power Training: A Game Changer - as well as a cool top ten list at the end of the week. So You Can't Squat? Do This Instead - This was a guest post I wrote for Jason Ferruggia. Training for Rotational Warriors - This was a guest post I wrote for Martin Rooney. 5 Common Assessment Mistakes - This was a guest post I wrote for Alwyn Cosgrove. The Most Important Aspect of Any Program - Here's an excellent post from Mike Reinold discussing the HPH program. Individualization: How Results Go from Good to Outstanding - This was a guest post I wrote for Kevin Neeld. Earning the Right to Train Overhead - This was a guest post I wrote for Wil Fleming. Easy Training Modifications for Overhead Athletes - This was a guest post I wrote for the International Youth Conditioning Association. Why You Must Not Stretch Hypermobile Clients - This was a guest post I wrote for The Personal Trainer Development Center. Efficiency: Important for the Joes and the Pros - This was a guest post I wrote for Schwarzenegger.com. Why It's Not Always JUST About Strength - This was a great article from Tony Gentilcore, and it complemented his earlier post, The Single-Biggest Mistake Most People Make With Their Programs, nicely. 7 Tips for Gaining Strength Fast - This was a guest post I did for Sean Hyson. Front Squat - This didn't really have anything to do with The High Performance Handbook, but it was an absurdly good post from Mike Robertson that deserves some love, especially since he reviewed HPH earlier in the week. High Performance Training with Eric Cressey - This was a Skype interview I did with Tyler at The Garage Warrior. Eric Cressey on Shoulder Work, Breathing, Business, and The High Performance Handbook - Anthony Renna interviewed me over the phone for the Strength Coach Podcast. Episode 275: Strength Adventure with Eric Cressey - Here, Kevin Larrabee interviewed me for The Fitcast. An Interview with Eric Cressey - As the name imples, Bret Contreras interviewed me, and you can read it here. How to Customize Your Training - Another interview, this time with Chad Waterbury. Q&A with Eric Cressey - Jim Kielbaso interviewed me for this post. Version 2.0 Interview with Eric Cressey - John Izzo interviewed me for a post on his website, too. Single-leg Success Strategies - This was a guest post I wrote for Fitocracy. I think this wraps it up. Needless to say, I did a lot of talking and typing last week! In case you missed it, you can still pick up a copy of The High Performance Handbook. Last Day to Save on The High Performance Handbook (and Win a Free Trip to Train with Me)! I’m just about to give a day long seminar in Seattle, but before I do, I want to give you a quick heads-up that today is the last day to get The High Performance Handbook at the introductory price. The price goes up at midnight tonight (Saturday) PST. When you order, you’ll be automatically entered to a raffle to win one of many prizes, including an all-expenses-paid trip to train at Cressey Performance. 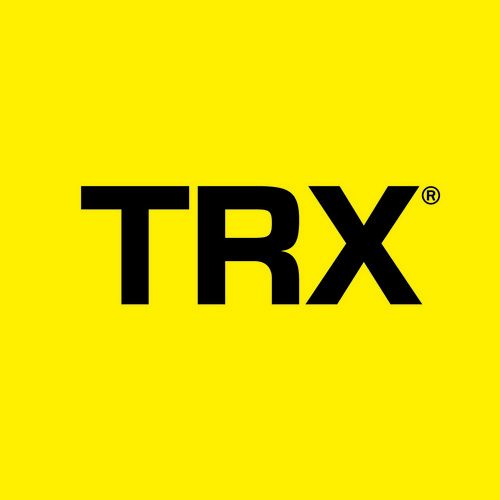 So, in addition to getting a great program that will teach you about how your body works and help you toward your training goals, you’ll also have the opportunity to win the training experience of a lifetime. "Eric Cressey is one of the top high performance coaches in the world. With his mixture of academic work, practical experience, and high level athletic achievement, he's outpacing almost everyone else in the field. As a result, he's one of the very few coaches I'll turn to now, and in the future, when I'm looking for unique insight into getting the most out of my athletes." Only 15 hours left – and I’d love your support. Thanks so much for a great week. 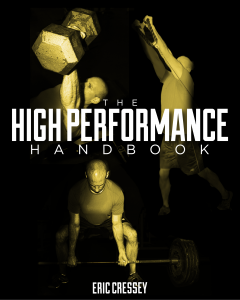 The High Performance Handbook: Prize Winners, New Content, Live Q&A, and More Prizes! Yesterday, our High Performance Handbook launch prize winners were randomly selected and announced! We gave away five CP t-shirts, three pairs of New Balance Minimus sneakers, and an all-expenses paid trip to Cressey Performance. The winners were from four different U.S. states, Canada (2), England (2), and Australia (1). We're worldwide, people; thanks for your purchases and help in spreading the word! 1. ANOTHER all-expenses-paid trip to get evaluated and train at Cressey Performance. It's like this, but you'll be surrounded by other clients who are all working hard like you will be! Again, I'll cover all your travel and accomodations expenses, and the training will be on the house. 2. One of three free copies of my "Art of the Deload" e-Book. 3. One of three free online accesses to Mike Reinold and my new "Functional Stability Training of the Lower Body" online resource. If you've already purchased, you're golden. If you haven't, you've only got 36 hours left! Last, but not least, Precision Nutrition's Brian St. Pierre - who authored The High Performance Handbook Nutrition Guide - is going to be doing a live Q&A on my Facebook page at 3pm EST. You can check it out and ask him your questions HERE. There are only 36 hours left, so don't miss out! Click here to learn more about The High Performance Handbook! About 50% of the benzene exposure in the US results from smoking tobacco or from second-hand smoke. Substantial amounts of data link benzene to aplastic anemia, bone marrow abnormalities and leukemia - particularly acute myeloid leukemia (AML) and acute non-lymphocytic leukemia (ANLL). Looking for more insights like these? Be sure to check out The High Performance Handbook here. And remember: the $30 off discount is only around for this week! With little fanfare, a study recently came out by Dr. Dariush Mozaffarian and colleagues. Why so little fanfare, you ask? It’s because the study suggests that dairy fat may actually protect against diabetes, and that goes against conventional wisdom and government recommendations. Dr. Mozaffarian and company collected two measures of dairy fat intake in 3,736 Americans. They took six 24-hour dietary recall questionnaires, as well as assessing blood levels of trans-palmitoleate. Trans-palmitoleate comes almost exclusively from dairy fat and red meat fat, and therefore it reflects the intakes of these foods. Dairy provided most of the trans-palmitoleate fatty acid in this study. Adjustments were made for confounding factors, and trans-palmitoleate levels were associated with a smaller waist circumference, higher HDL cholesterol, lower serum triglycerides, lower C-reactive protein (a marker of inflammation), lower fasting insulin and lower calculated insulin resistance. In addition, people who had the highest levels of trans-palmitoleate had 1/3 the risk of developing diabetes over the 3-year study period. Again, it is important to note that trans-palmitoleate is a fatty acid, and so is only provided in significant amounts by whole fat dairy, not from low-fat or fat-free versions. The investigators also noted that “greater whole-fat dairy consumption was associated with lower risk for diabetes.” This is an important distinction, as it wasn’t just trans-palmitoleate levels that were associated with the decreased risk, but the actual consumption of whole-fat dairy itself that seemingly provides the benefit. While it is certainly possible that trans-palmitoleate is mediating a lot of these positive health outcomes that were associated with it, in all reality, it only makes up a tiny fraction of the fat content of milk. I tend to believe that instead, it is more of a marker of dairy fat intake, with the benefits more likely coming from the other elements contained in dairy fat – CLA, vitamin K2, butyric acid, vitamin D – in addition to the trans-palmitoleate. Okay, so we know lack of sleep is a problem. As researchers have noted regarding sleep debt: "these alterations are similar to those observed during aging and sometimes during depression." Awesome. Fortunately, research also shows that simply getting adequate sleep can quickly right the ship on these issues. [Note from EC: Brian goes into great detail on strategies to improve sleep quality and duration in his guide]. I'll be back later today with a few more key points from BSP's manual, but in the meantime, you can check out The High Performance Handbook here. Don't forget: the $30 off discount is only around for this week! I have attended a lot of great seminars during my time in the strength and conditioning field. In the early days, I’d walk away with a lot of valuable information that I could immediately apply. It was almost like drinking from a fire hose! Interestingly, as the years went on, I took less and less from seminars – in spite of the fact that the fitness field was a rapidly evolving industry, with new research emerging every single day. The reason for this is very simple: as the industry developed, so did my knowledge – which means I had developed a better filter to separate what was useful from what wasn’t a good fit for my clients. As a result, when I attend seminars now, I’m psyched to walk away with one or two things – however small – that we can immediately apply with our clients. And, if I come across something that does more than that, it’s a game changer. For me, the concept of working from the inside out – or proximal to distal - has been exactly that. Since it's a recurring theme in the program in my new resource, The High Performance Handbook, I thought I'd use today's post to go into a bit more detail. Simply stated, this means that you get things right in the core before working on what’s going on with the extremities. It seems so basic, but it’s something that’s been missed by loads of fitness professionals and rehabilitation specialists for a long time. Why stretch a shoulder or the hamstrings if you haven’t taken into consideration where the lumbar spine is positioned? This wasn’t just one part of a seminar, though; it was a theme that kept emerging on a number of fronts. First, the research demonstrated that training core stability improved hip internal rotation. That’s right; you don’t have to stretch someone into internal rotation to improve it. Just get people to "neutral" and then stay there while training, and good things happen. Then, I checked out some of the Postural Restoration Institute seminars, applied some of their positional breathing principles, and saw athletes gain more than 30° of shoulder internal rotation without me even touching their shoulders. Their hip internal rotation improved, and they were able to adduct and extend the hips more effectively. Seeing these changes in action was awesome, but at the same time, they were moments that made me think “why didn’t I ever think of this before?” It’s just a matter of restoring proper alignment with breathing and adequate core recruitment to facilitate that breathing. When alignment is “on,” protective tension doesn’t have to kick in. If you stretch and you’re out of alignment, you get instability. If you strengthen and you’re out of alignment, you shift more stress to passive restraints (which may create more instability) and you get overuse injuries. Working proximal-to-distal is a theme you see in all our warm-ups and the way that we approach arm care with our athletes. If you establish “good stiffness” early on, warming-up the entire rest of the body becomes a much more efficient process, as you aren’t just reaffirming bad patterns. As I noted, this proximal-to-distal approach is also heavily emphasized in my new resource, The High Performance Handbook, in the assessment portions, programs, and detailed exercise technique videos. Regardless of whether you’re looking for some direction in your own training or in your work with clients, this will be a "clutch" resource to which you’ll refer for years to come. It's on sale at a great introductory price through the end of the week; you can pick it up here. The High Performance Handbook: Years in the Making! I'm psyched that my multi-year project - The High Performance Handbook - was finally released just a few hours ago. You can check it out at www.HighPerformanceHandbook.com. This resource is a by-product of spending many years in the gym trying to find out what works and what doesn't - and just as importantly, how to customize programs to individuals' unique needs quickly and easily. As the testimonials from "guinea pigs" who've completed the program show, I think we've done a great job of it. As a bonus for people who actually buy today, we're giving away a bunch of free stuff today. Most notable is an all-expenses-paid trip to train with us at Cressey Performance! If you've enjoyed my work at EricCressey.com and beyond, I'd be thrilled to have your support today - either with a purchase or in helping to spread the word (or both). Thanks so much! The Wait is Over: Get The High Performance Handbook – and Win a Trip to Train at Cressey Performance! After over a year of hard work in getting it ready, I’m beyond ecstatic to announce that my new resource, The High Performance Handbook, is now available for sale. You can pick it up at www.HighPerformanceHandbook.com. I went to great lengths to ensure that this resource doesn’t just offer a training program that delivers outstanding results; it also educates you along the way. You’ll learn about some of the things that are unique about your body, and how you need to manage your training accordingly. It’s almost like a choose-your-own adventure book for people looking to achieve their training goals. To celebrate this exciting launch and thank you for your continued support, I’ve decided to sweeten the deal for anyone who purchases the product before Tuesday at midnight (PST). If you do so, you’ll be automatically entered to win a number of prizes, most notably an all-expenses-paid trip to get evaluated and train with us at Cressey Performance. If you’re selected, I'll pay for your airline ticket, put you up in a nice hotel, feed you, and “coach you up” alongside all our regular clients. And, even if you don’t win this one, you’ll still receive some awesome free bonuses no matter what. Also, while you’re at it, I’d highly recommend you pick up the Gold Package of The High Performance Handbook, as it includes an awesome nutrition and lifestyle guide from Brian St. Pierre of Precision Nutrition. There is some really eye-opening and useful stuff in there; I learned a ton myself from reading it! Again, you can pick it up at www.HighPerformanceHandbook.com.